Looking for the most perfect fish and chips you'll ever find? 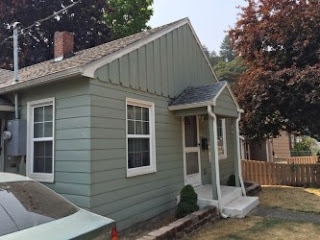 Take a two hour ride on your moto from Portland, OR to Astoria. There, on the north end of town on Duane and 16th you'll find one of the best food "carts" I've ever experienced. It's actually a landlocked boat sitting rather unexpectedly on the burr of a gravel lot. 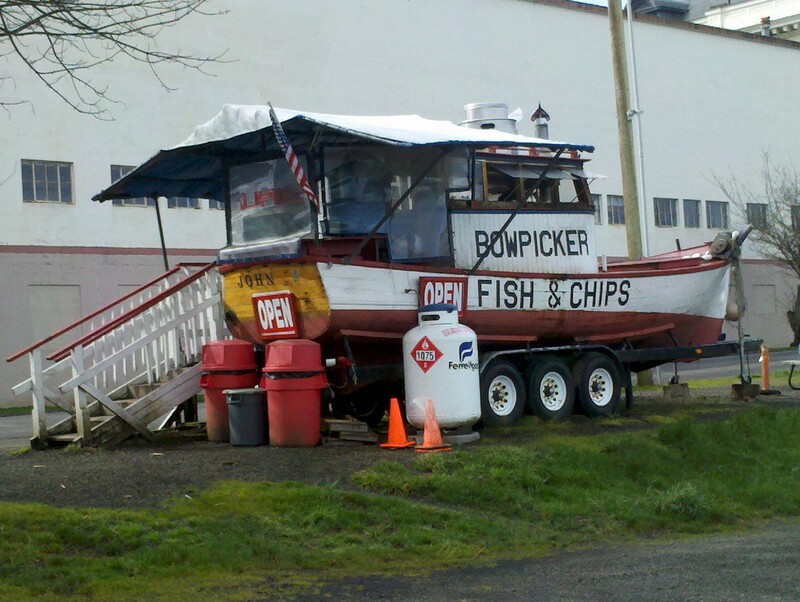 The Bowpicker has been on the same site for 11 years since this family business opened. They serve fish and chips and only fish and chips. But, they do it superbly. Half order of heavenly tuna! There has been a line up the dock and down the stairs every time I've passed. This week I was lucky enough to drive by just as they opened at 11 (sign says 11ish to 6ish Wednesday through Sunday). There were already five people waiting in line. As you wait for your order (which is actually not long at all), you can read about the bowpicker and it's history. Where else can you an education and great fish? In a town full of fish and chips and breweries fighting for your attention passing this place up would be easy. It would also be one of the biggest mistakes you've ever made. Their fish is fresh tuna that has been beer battered and fried to perfection. Their fries are big and thick cut. 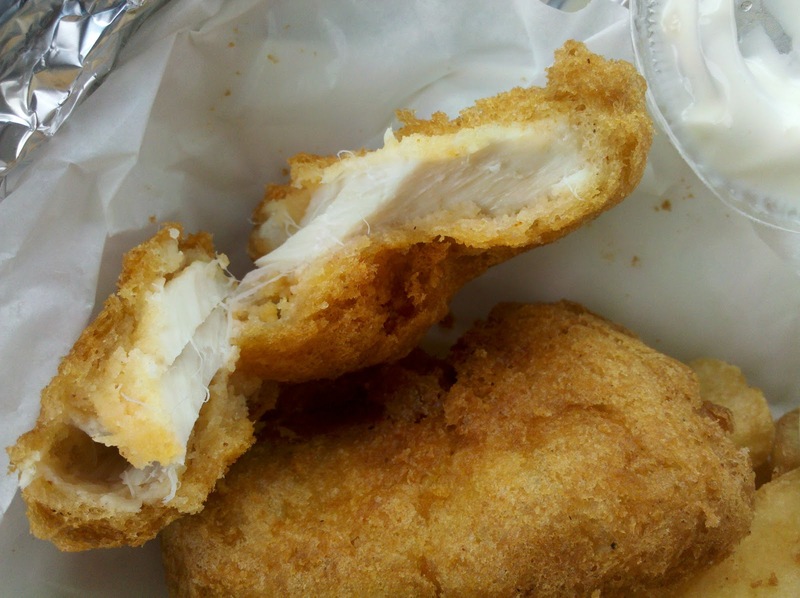 I'm not a big fan of fish and chips since they always seem to be soaking in grease. Not these. The fish was perfect (none of that fishy taste either) and the batter was tasty and not too thick. Prices are reasonable considering what you get: for $7.00 you get a half order which includes three pieces of fish and fries. For $9.00 you get the full order which is five pieces. And PEPSI products! Yippeee! 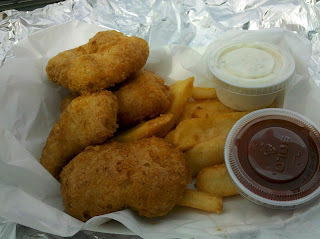 I highly recommend Bowpicker Fish and Chips and so do the "regulars" I was sandwiched between while waiting in line. 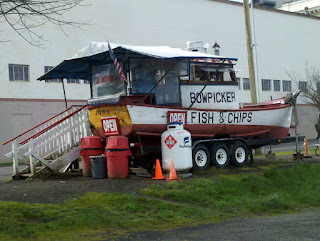 One had been coming to Bowpicker since it opened 11 years ago. It's a place where they know your name, are happy to see you, and serve awesome food that will keep you coming back for more. I know I'll be back over and over.